Born in Philadelphia, his talents were recognized at the early age of sixteen, at which time he already had a dozen or so semiprofessional plays to his credit. After serving in the armed forces throughout the entire world as entertainment director for our occupation troops, he settled in Hollywood where he studied acting and directing. After a few years in radio, stage, industrial shows and documentary films, his travels led to Chicago where he wrote, produced and directed his very successful television show "Time For Teens" in affiliation with Station WGN. 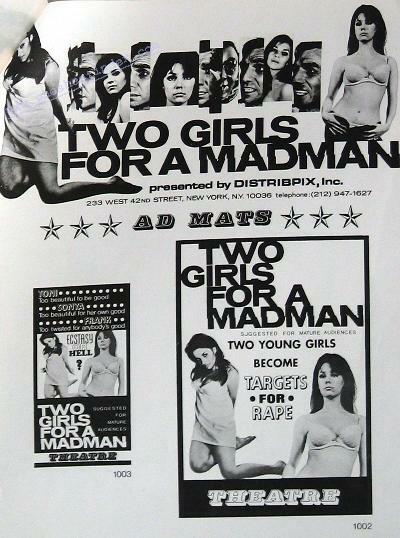 Two Girls for a Madman introduces him as a fresh bright talent, and a welcome addition to the film industry. After being in this country for only twelve years, Mr. Petra- shevic has worked with such notables as Oscar Award winning director, Pierre Gasseau, and filmed such stars as Gloria Swanson, Jan Sterling, Eddie Albert and a host of others. Born in Latvia, he spent years filming for UFA throughout all of Europe0 This professional background is evidenced in "TWO GIRLS FOR A M?~DMAN" as we view camera work which is highly skilled and creative, but still containing a freshness in keeping with the direction of the film. Mr. Petrashevic has long been active as a director of photography and today is the owner of a fully equipped sound stage and studio.